Visitors at the Stephen F. Austin State University Observatory's public viewing session will have the opportunity to see constellations and star groups and learn about star lore 7 p.m. Saturday, Feb. 24, weather permitting. NACOGDOCHES, Texas - The Stephen F. Austin State University Observatory will host its next public viewing session 7 p.m. Saturday, Feb. 24, weather permitting, giving visitors the opportunity to see the night sky like they have never seen it before. Opening its doors to the public periodically throughout the year, the observatory is home to over 15 telescopes, including one formerly used by NASA. The sessions offer visitors "an opportunity to do what they can't do at home, and that is see the nighttime sky," said Dr. Norman Markworth, professor in the Department of Physics, Engineering, and Astronomy and director of the SFA Observatory. Visitors will have the chance to view the facility's 41- and 18-inch telescopes and can utilize 8-inch telescopes set up for public use. Students from the SFA chapter of the Society of Physics Students will assist with use of the telescopes, while visitors receive a quick lesson in sky lore and view constellations and star groups. 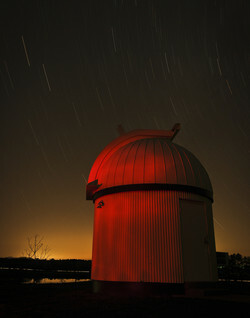 Housed 11 miles north of Nacogdoches, the observatory was built in the mid-1970s and has aided in various research efforts. Among its equipment, the observatory boasts an 18-inch telescope originally used by NASA on the Marshall Islands in the 1960s to help find landing sites on the moon. "The story I heard was NASA wasn't going to pay to have it shipped back to the U.S.," Markworth said. "They were going to throw it in the ocean. I don't know what happened, but they were finally convinced to ship the telescope back, and it lives here now." Today, the telescope is primarily used for asteroid hunting, Markworth said. The department also has a 41-inch telescope, built by Markworth and the department, used predominately for variable star research, a 16-inch telescope in a roll-off roof observatory and several other telescopes. The observatory is used for educational purposes, giving students a place to conduct research and hosting astronomy students several times a week. "It's my philosophy that we do what students want done," Markworth said. "If they want to work on projects, we'll see that we can do it." While the observatory is primarily used for research, viewing sessions are held throughout the year to give the public an opportunity to see what they might not be able to see at home. "I think humans have always had a curiosity for what that stuff is up there," Markworth said, "and the more prevalent technology is, the less people actually want to know about stuff in the sky. But if you tell them, they're really curious. They want to know more." The event is free and open to students and visitors of all ages. For large group accommodations, email astro@sfasu.edu.